Sandra Leavitt suffers from a rare seizure disorder, and she relies on her 4-year-old pit bull, named Nikki, trained to detect the scent changes in her blood and provide warning signs up to two hours before the seizures actually occur. The 2-year-old Alida Knobloch can play with her friends thanks to the help of her pooch named Mr. Gibbs who carries her oxygen tank for her to breathe. 1. Service dogs are not pets. 2. Training a service dog can be costly and time-consuming. The preparation for service dog starts when they are only 2 days old puppies, with neuromuscular stimulation exercises that prepare the animals to handle potentially stressful situations and routinely perform specialized tasks. It can last with months, and sometimes even years. 3. Any breed can do it, but retrievers were born for it. According to the ADA, any breed can work as a service dog. But experiences show retrievers are among the best because they love to use their mouths. Plus, they have good public perception, unlike pit bulls, which in some states are banned to be used as service dogs. 4. The service dog vests are optional. 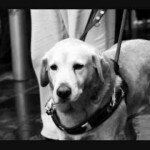 ADA does not require the service dogs to wear any gear that identifies them as working dogs. They only need to wear a leash or tether, unless it interferes with accomplishing a task, and are allowed to accompany their human partners anywhere thats open to the public, including airports or restaurants. 5. Service dogs require care, too, but the rewards are priceless. The service dogs may get injured while working, hence they require daily care, but thanks to them, people with disabilities are able to work and reach new levels of independence. As Jennifer Arnold says, "it's a huge commitment, but the fact that it's a huge commitment is a huge benefit for folks who had never been responsible for something in their lives."